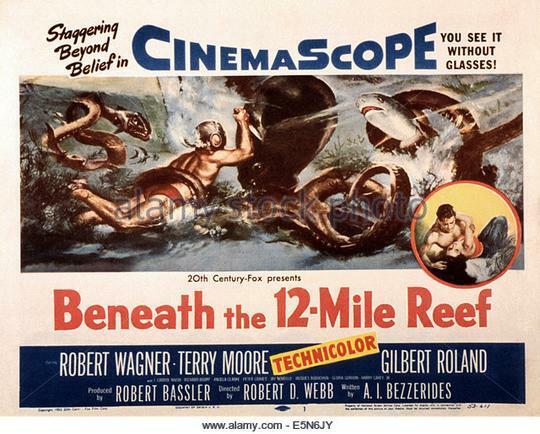 With Cinemascope backed up by a tremendous score from Bernard Herrmann and a stupendous cast of character players surrounding youngsters Robert Wagner and Terry Moore, this underwater adventure is hard not to like. Better still, it looks fantastic if you happened to pick up the recent blu ray release from Twilight Time. This Romeo and Juliet flavored story begins with a family of Greek sponge divers led by the bigger than life Gilbert Roland as the head of the family. Wagner plays his son, Angela Clarke his wife, Gloria Gordon as his daughter and another fine character actor as his brother played by J. Carrol Naish. Miss Terry Moore’s family represents the opposing side of our confrontation over the hunt for sea sponges. Commanding Richard Boone plays her father while Harry Carey Jr. stars as her brother and Peter Graves as the man who intends on claiming Moore as his own in the marriage department. When Roland and his crew return to port with very little in the way of saleable sponges, he sets out to head towards the Everglades where Boone and his party hijack the sponges of all those they see as interlopers in their territory. Fellow Greek Jay Novello has returned with a high grade catch of sponges from the notorious 12- Mile Reef against all odds. It’s the same Reef that Roland lost a son and Wagner a brother to in the treacherous waters. To see Novello and Naish share the screen is to see two wonderful scene stealers battle each other for the top honors. While Roland is underwater in a diving suit in the Everglades he is soon to make an enemy when Graves and his fellow hijackers get a hold of his airline. Hot headed Wagner wants to put a bullet in Graves as he holds Roland’s life line in a row boat wielding an axe above it but Naish talks him down. Graves will signal for Boone’s boat to come along side and the sponge hijack is complete. Roland wants his vigilante justice and will follow Boone’s ship to a port where Greeks are not exactly welcome. Roland’s onscreen charm never fails to lure me into his performance and though he may be itching for his pound of flesh he settles for drinks with Boone and light heartedly warns him that the next time he’ll be the one to come out with the riches. Wagner on the other hand quickly eyes up Miss Moore and she’s hip to his groove. Graves, clearly the villain of our tale is not amused. Thankfully Roland will beat the hell out of him before they head back to friendly waters. With no sponges to bring home Roland makes an ill fated decision to head towards the Reef. This leads to a solid scene from “Amigo” as Roland was known as around tinsel town. Wagner wants to become a man by heading below the waves but Roland pulls rank as Father and descends to the depths in search of riches. Despite his sending up a wealth of sponges it’s all going to lead to a case of the bends and death. Despite a race for medical attention, Roland succumbs to the fate many divers face when diving into deep waters. Wagner is crushed and we’ve still got half a movie to go that will see him tangle with Graves, romance Moore and spar with Boone. All this while becoming a man in the absence of Roland. 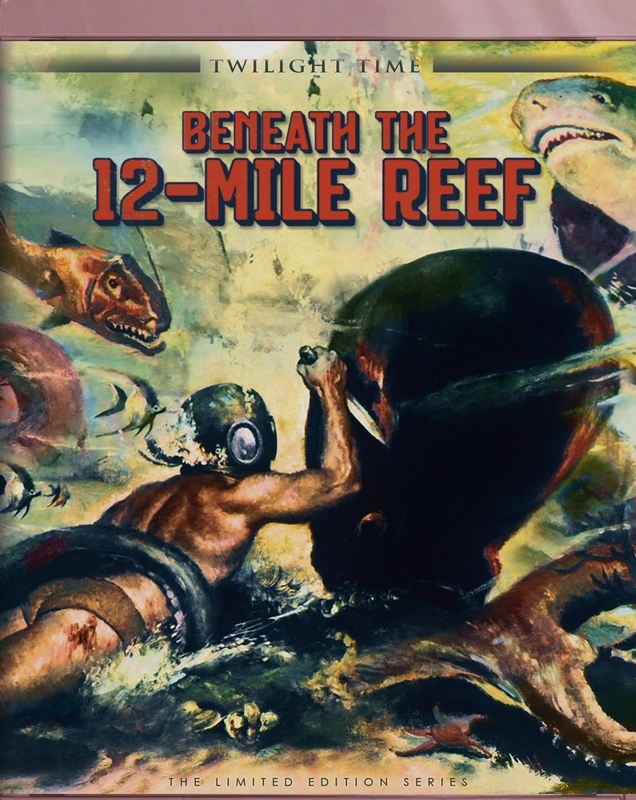 What’s a man to do when both his father and brother die while diving the 12-Mile Reef? Well if you’re Robert Wagner I guess you don’t listen to your loved ones and tackle the deadly reef and surrounding waters for yourself. But hey, we all knew that going in. Do I like Robert Wagner? Yeah I guess so but for me the real value in re-watching this Robert D. Webb directed effort comes from Roland, Boone and Naish. This trio of actors on their own always merit consideration when picking a film to watch but when all three share the screen together it’s pretty much a given that I’ll be watching. Even if this is a rather pedestrian at times attempt to turn Wagner and Moore into STARS. It’s just too bad that Roland had to be sacrificed for the sake of the plot building up Wagner’s character as the man of the family. Peter Graves is a real S.O.B. here and deserved way worse than anything the script dealt him by the fadeout. It’s also interesting to note that on the blu ray from T.T. the A&E Biography episode on Wagner is included and was of course narrated by Graves. There’s a scene here that reminded me of the infamous scene in Tarzan and His Mate featuring some underwater frolicking between Wagner and Moore. In the end it’s no where near as racy or as titillating as when Johnny and Maureen took to the waters in black and white. Wagner and Moore would be reunited in 1956’s Between Heaven and Hell. I also wanted to point out that the score by Herrmann couldn’t help but remind me of the music he’d put to Journey to The Center of the Earth 6 years later in 1959. While watching Reef I was instantly reminded of Journey’s score and just to be sure I checked to see if Herrmann did both films and sure enough I wasn’t imaging the similarities. Reef had fallen into public domain years ago so it’s always been an easy film to locate in bargain bins but I’d question the quality you might be paying for. I guess that’s why I’ve ignored a second viewing for years. I believe I saw this as a youngster on TV and now that it’s had the blu ray treatment I felt it was time for a revisit. I remember being bored senseless on the only occasion when I saw this film. Nevertheless, it remains vivid in my memory – a strange paradox! I like Terry Moore (I used to have a friend who was mad about her), but have always thought Wagner had all the appeal of a dish of melting vanilla ice cream. As to Gilbert Roland, he was a fine actor – and I do urge you to see him portraying an Englishman (!) in: ‘Our Betters’ (1933), based on the play by Maugham. Beg, borrow, steal – or, if you must, buy a copy. (Maugham never fails to entertain – and his novels and stories evince a penetrating understanding of the human animal. I saw Wagner on the stage, some years back, in a production of: ‘Love Letters’. His flat delivery cast a pall over the evening. I can see that with Wagner. He really has little range but it’s hard to argue the fact that he’s been on the go for years and done well for himself. Especially on TV when I was a youngster. Just looked up that Roland film… an Englishman named Pepi D’Acosta! I’ll be on the lookout for it. Interesting you should see similarities in the Herrmann score for this and Journey to the Centre of the Earth. The same applies to On Dangerous Ground and North by Northwest. Oh well, he was stealing from himself! I love his music. Like any singer I guess composers have tell tale signs that you’ll recognize. And yes his music is a wonderful match for big screen thrillers. Good review–I’m always up for praising Roland, Naish and Novello (love him in “The Lost World”) and of course Herrmann. I’d like to see this in Blu Ray, bet it’s a dazzler. Tough time often with RW and CAN NOT abide Terry Moore–one of the all-time worst. That music alone is worth it. The Wagner-Moore casting seems to irk plenty of fans but that back up cast is worthy of our attention. Really does like beautiful on blu ray if u get the chance and Herrmann’s score memorable. The back up cast definately lures you to watch it. Saw it on the big screen as a young boy. Gilbert Roland always infectious on the screen. Cinemascope and technicolor boosted the appeal of this film at the time opening during the 50s. Best regards. Roland has always been a favorite of mine thanks to his turning up in support of so many leading men in 1950’s cinema. Notably westerns and adventures. Mountain not bad but always felt the age difference between Tracy and Wagner was too much of a stretch. He’s showcased here as the young beefcake for the ladies to fall for in hopes of increased box office dollars. Yeah I hear you on the age gap, it would of worked just as well in the story if they were father and son.